All illnesses are basically an imbalance of (yin/yang) energy. This can be a stagnant, deficient or excessive condition. The purpose of Medical Qigong is to disperse excessive energy, move stagnant energy, tonify deficient energy and restore balance. It is the oldest form of Chinese Medicine, having been used for thousands of years. Your first session will take about 90 minutes. We will review your (pain) history, current condition and concerns. You will then lie down on a massage table to receive treatment for about 50 minutes. Wear comfortable clothing and relax. You will enter into a meditative state while I scan your energy fields and detect any imbalances. Medical Qigong treatment is highly intuitive and takes place on a sub-conscious level. When you awake from another dimension, you will feel calm and rested. It may take a few days to feel all the effect, and during this time you can sometimes experience emotional releases or fatigue as toxic energy is expelled. We will evaluate the session and I will suggest and explain specific Qigong exercises to assist in further healing. Tailored to your circumstances, these exercises use physical movement, breathing, healing sounds, and mental intention to correct and restore the energy flow. These prescription exercises are the most important benefits of Medical Qigong, because they empower you to take control over your own body, by providing the tools for self-healing. This eventually reduces the need for ongoing therapeutic interventions. When Yin and Yang are in harmony, the body heals. Medical Qigong can treat and cure many conditions that are considered irreversible by Western Medicine: Diabetes, Arthritis, MS, Dementia, BPH, Impotency, Spinal Injury, PTS, Hypertension, etc. The list is endless, however, there is no such thing as an incurable disease in Chinese Medicine. That does not mean that there always will be a cure, but even when total (physical) recovery cannot be achieved, healing may still take place on an emotional or spiritual level. Healing with Medical Qigong takes place beyond space and time and cannot be understood by the rational mind. It works from any distance, so called remote treatment is possible if you are away or not being able to meet in person. I have succesfully treated some of my friends overseas. 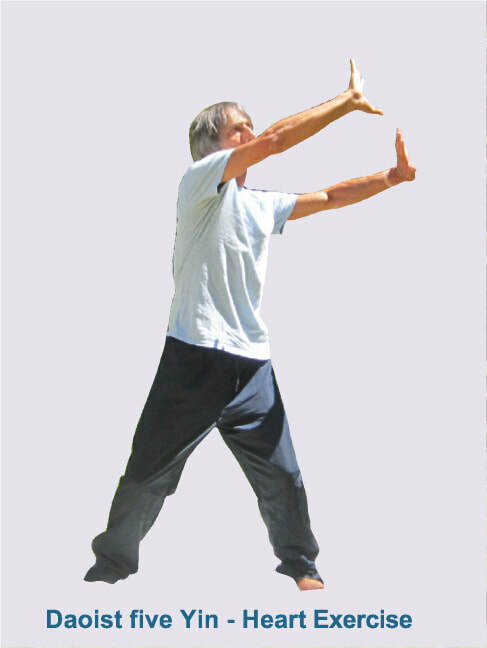 There are many different forms and variations in Qigong. I can teach the following sets of exercises in a small group, class or one to one. Each set can be performed in 15-20 minutes. Classes can be customized according ability and experience, from beginner to advanced. Classes and workshops are now being planned, starting in Februari 2019. Please let me know through the contact form if you are interested and I will keep you informed about the exact date/place. This exercise massages the five yang digestive organs and improves the digestive system. It stimulates the five yin organs and the meridians for each specific organ: lungs, kidneys, liver, heart and spleen. This is a good Qigong workout to purge, tonify and regulate the body’s internal organ energy. This set consists of 10 different exercises, each with its own specific purpose and application. It is widely used in Qigong clinics in China as a prescription for ailments and disease. They can be used both for tonification and purging and are very powerful and healing. These techniques are designed to disperse stagnation and excess conditions, as well as to activate and regulate the energetic flow within the body’s external and internal channels, thereby increasing the energy flow. A very good way to start the day. A gentle set to regulate the five yin organs (liver, heart, spleen, lungs and kidneys). One of the most famous and practiced forms of Qigong, consisting of eight exercises to energize the body and cure illness. A very effective set of breathing exercises, exhaling sound and (imagining) inhaling color. These are specifically used to balance emotions and their effect on the yin organs. Expel the five negative emotions and gather the five positive emotions. According to the ancient Taoists, the body can live for three hundred years! Although this is probably not possible in today's age, it is not so that after fifty years our health and bodily functions must go downhill. Most age related ailments are caused by unhealthy lifestyles: bad diet, lack of (or too strenuous) exercise, a toxic environment and exposure to stress. Moreover, it is our lifelong conditioning, to expect and accept degeneration of the body as something natural, that is bound to happen. Through cultivation of the life-force (sexual) energy it is possible to reverse the process of aging. This is accomplished through an ancient Taoist meditation technique callled “Microcosmic Orbit”, which has been a long-held secret. As your Coach I will introduce, teach and explain the workings and philosophy of the mystical ancient knowledge of Internal Alchemy. I will share valuable insights with my clients who are ready and dedicated to explore these long held secrets to longevity. Another aspect of coaching will focus on life-strategies and the unlearning of acquired conditioning. Coaching is integrated in sessions with (Medical) Qigong. My intention is to inspire, advise and guide you on your path to grow younger. Not to de-generate but to re-generate.